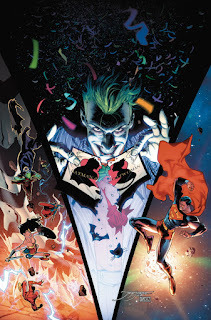 It's unclear whether that's a final figure — the Final Order Cutoff on that April 18-shipping anniversary issue was March 19, according to Diamond's retailer site — but regardless, it would rank among the top comics in unit sales this century. Exactly where it would rank will depend partially on what portion of the orders are bound for North America. 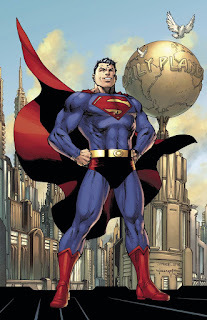 As our Top Comics of the 21st Century chart shows, ten comics since 2000 have seen more than 400,000 copies shipped — though we cannot account for multiple reprints of Ultimate Spider-Man at the beginning of the century, which happens to also be by Brian Michael Bendis, whose DC run the Action issue begins. 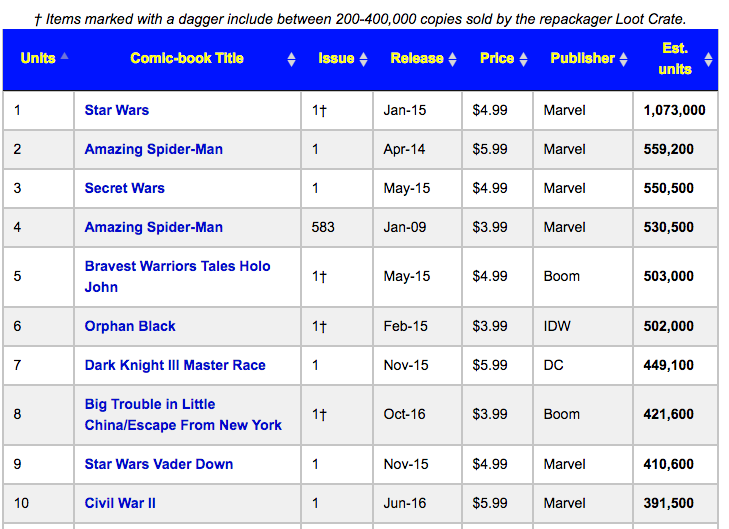 It will be noted that four of the top sellers had significant additional sales via Loot Crate; 2015's Star Wars #1 would likely still rank as #1 without those copies, but the other three wouldn't be in the Top 10 at all. If DC's 500,000 copies were to, say, include 50,000 for markets outside North America, it would land right at sixth place — but that would really be closer to fifth place, excising the Loot Crate books. The books in the chart continued to have sales, of course, via reorders, so it's likely wherever it would lad after April would not be the final destination. But those are the targets in the record books at the moment. Perhaps more important for retailers is that the issue is priced at $7.99, which is obviously higher than anything on the list above. Something like $4 million at full retail would put it above everything but Star Wars #1 in dollar terms — and given how many of its copies went through Loot Crate for a nominal price, if anything, the Action issue might already well be past it in actual dollars realized. Comichron has an April 2018 page online already, showing other activity relating to issues shipping in the month. One thing most of 2017 suffered from was a lack of prominent comics which created positive headlines; 2018 seems to be getting a few already. (Update: One of those books will be Amazing Spider-Man #800 in May; Marvel announced after DC's presentation that the issue had orders topping 300,000 copies, with time yet to go. Never before have two comics priced above $6 — much less priced near $8 — led the market, but it's quite possible. See other top sellers since 1996 here.) It'll be interesting to see how much impact they might have on the rest of the market. Hey man I read kenobi. That was amazing. You did good. Didn't know you liked comics. That makes you even cooler. Thanks very much! I got my start in comics -- reporting on them and the writing them. You can read my notes on Kenobi at http://www.farawaypress.com/fiction/books/swkenobi.html -- there are links to the comics I've written there, too.